Fresh garlic is available year-round. Break garlic segments away from bulb. Place clove under the side of a large knife and pound once or twice to remove skin. 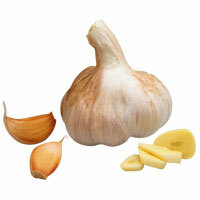 In recipes that call for whole garlic cloves, simply break cloves from bulb, peel, and add to dish. Use chopped or puréed garlic to season anything from salads to soups, from sides to main courses. Roast garlic for a smooth, nutty flavor. Put unpeeled cloves in a 350°F (175°C) oven for 15 minutes; mash and use in sauces, spreads, and soups.